At the forum 'The Crisis of the Public University' held at the UC Berkeley Pauley Ballroom, none of the speakers mentioned as a distinguishing characteristic of public universities the fact that the governing board ought to be representative of and accountable to the public. 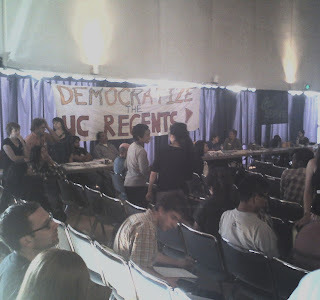 The undemocratic nature of the UC Board of Regents received no attention from the speakers. The speakers included Phill Ting, Nelson Maldonado-Torres, Naomi Klein, Jayna Brown, Ananya Roy, George Lakoff, Stan Glantz, Alberto Torrico, and Ariel Boone. The forum's video will be online shortly. Proposals for electing some regents (as faculty representatives) were discussed at the first campus meeting of the UC Commission for the Future, held at UCSB. The forum's audio was broadcast on the internet. Gould and Yudof failed to show up however.